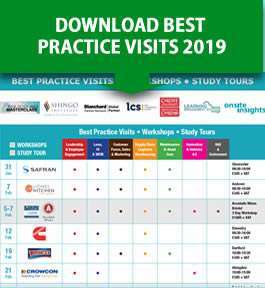 S A Partners are pleased to publish the 2019 plan for Best Factory Visits in conjunction with Onsite Insights. With best practiice vitis to compies such as Princes, Toyota, AGFA, and BAE Systems, they provide an excellent opportunity to learn best practice techniques in outstanding organisations. These company visits are a well established method for companies to network, benchmark and innovate. They should become part of any organisations continuous improvement strategy. Seeing in practice how organisations have overcome issues and achieved success has allowed thousands of companies around the world to improve their own businesses. Visits are successful because they enable visitors to ask the managers who have implemented change how it was done, what the challenges were, and how they were overcome. The answers aren’t from a text book, they are real. and more importantly they have worked. You can download the 2019 plan, and if you would like to find out more, email ailsa.carson@sapartners.com.